Microsoft has gotten smarter now with their Windows Genuine Advantage (WGA) garbage that they are ramming down our throats. First it was simply not giving us access to programs like Anti Spyware and Windows Defender. Thankfully there is a way to get rid of this crap from your PC. After some searching and browsing I have gotten a setup that works 100% with the current WGA patch Microshaft have put out – it’s just a two step process that just about anyone can follow. This short guide will tell you how to remove the annoying screens! Step 1: First restart your PC into safe mode and log into the administrator account or any account with administrator privileges. You then must access both the Windows\system32 and Windows\system32\dllcache folders. Under these two folders are a file called WGATray.EXE. You must delete this file from both directories. This is what Windows Loads at start up to pop up the balloons when your copy of XP is loaded. Once there you will see a folder called “WGALOGON”. This folder must be removed to prevent Windows XP even loading any of the DLL files associated with the WGA setup. Once you have managed this you can then restart you PC and no more of the annoying balloons, popups or timed login screens. This won’t get you around the access problems such as downloading files that aren’t for non genuine Windows versions, but there are no more annoying quirks to logging into your PC. Last edited by amd_man2005; 06-20-2006 at 10:53 PM. Correct you will NOT be allowed to get Windows Update alright. Top left hand side,you can get all of the same windows update this way. Gee since you're stealing their software and all, who would have thought Microsoft might want to get to you to purchase it legally? Alright for some clarification here. The newer version of WGA is an OPTIONAL update to install. You do not have to install it, I didn't and I don't get any messages nor have any problems still using Windows Update. And yes, I have the original WGA on my PC. So, they are not jamming WGA down our throats, in a sense of realism. I honestly have to agree WGA is a good idea in principle, as logn as MS takes care of those it wrongly considers illegal. THANKS IT FIXED MY OTHER COMP TO. who cares all they are doing is helping so shut up homer. Everyone has this stuff posted everywhere. I could care less about fixing illegal copies of XP, but BURTON88, you are gonna need to OC that CPU to at least 3.2GHz before you can even think about easing the CPU bottleneck on those cards. And that PSU is woefully capable of powering such cards or your system when overclocked. You'd be better off selling one of those cards and getting a beefier power supply. Hardly illegal. I think you might find it so if you misunderstood what this were. This does not aid users with illegal copies of Windows from using any Microsoft software they aren't already using. It does allow them to function with less annoyance. It may be aiding them, but it is in no way illegal. 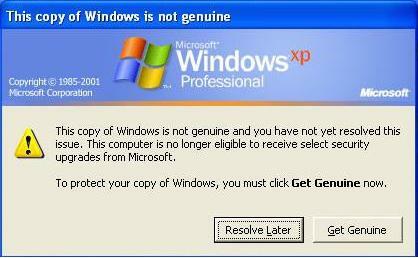 The XP Professional corporate key generator that Tweaktown once had was illegal and Microsoft did convince Cam to remove it. This doesn't involve using any materials not found in Windows itself. This practice falls in the grey area in my opinion. It's not really illegal to remove it, or disable it, since the latest installment is an optional update and not required anyway. Also its not like a base copy of WinXP has it, it's only something acquired by downloading and installing Service Pack 2.